A young offenders institution in Dorset has been heavily criticised in a report following an unannounced inspection. Chief Inspector of Prisons Anne Owers said some buildings at Portland Young Offenders Institution were unfit for purpose and lacked basic sanitation. Some of the 556 inmates had to use buckets in their cells and threw excrement and urine out of the windows. 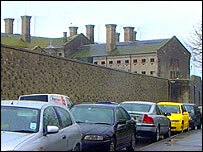 The Prison Service said it was working hard to address the instituion's "underlying problems". The report also criticised "a negative staff culture" and pointed to insufficient training opportunities and inadequate physical activity for inmates. The report did recognise that conditions had improved since the last inspection in 2004, but improvement efforts were still being compromised by overcrowding. Inspectors also found that "bullying was a major issue and arrangements for identifying and dealing with it were weak, as were aspects of suicide and self-harm prevention". The report did recognise that "good and innovative work" was being done by staff in some areas and that managers were trying to tackle the prison's underlying problems. Phil Wheatley, director general of the Prison Service, said: "Portland's management team have been working hard to provide an appropriate environment for the young people in their care. "I recognise the challenge of working successfully in outdated and inadequate buildings and the challenge of opening more accommodation. "The prison has robustly addressed the bullying issues raised by HMCIP with additional staff resources and a new violence reduction policy." Ms Owers said: "In spite of its continuing difficulties, Portland had improved and managers were well aware of the scale of the task ahead. "But that task was greatly compromised by the effects of population pressure. "As we inspected, the prison was preparing to increase its population with a new quick-build unit. "Instead of replacing the unfit wings, the new buildings will operate alongside them. "The expansion of the prison will compound the existing difficulty of finding enough appropriate work, training and activity to try to break the cycle of reoffending. "There could not be a clearer example of the damage caused by the prison population crisis."